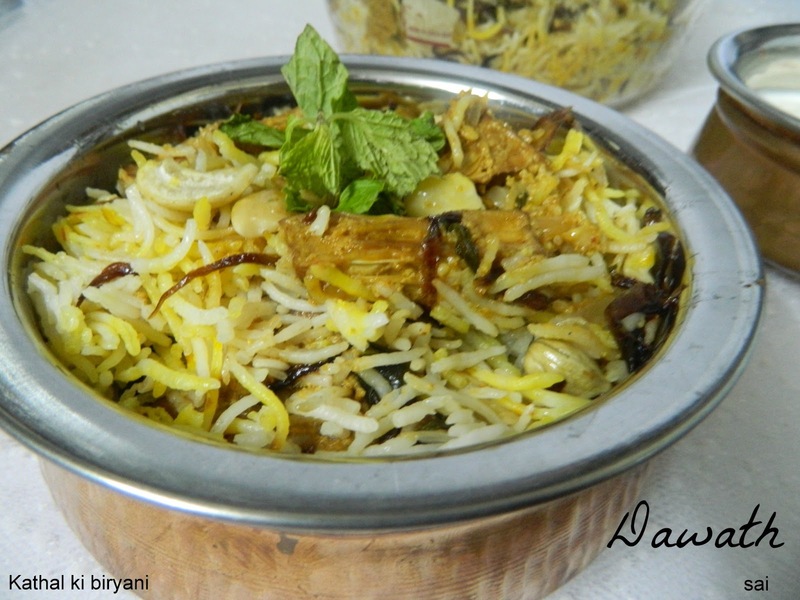 Kathal ki biryani is my guru Sanjeev Kapoors invention.I adapted his recipe and modified as per my needs.This is a killer biryani.It came out so well ,I just want to prepare it again and again.Our house was filled with the aroma of spices when the preparation was on.My husband was out of station,as it is he is simply a amchi food fan,so I got an opportunity to prepare this awesome biryani which was in my list long back.My sister prepares this often and I had tasted it at her place.I have made major changes in the recipe. Kathal means raw Jackfruit.Jackfruit season has already begun and we are getting showered with the fresh jack crop from our relatives.We too have a tree at our factory and our house ofcourse.We prepare lots of Amchi delicacies with the fruit.The list is endless.Stay tuned for more Jack recipes. Soak the rice in 3 cups of water for half an hour, drain it and keep it aside. Heat ghee in a cooker,fry onions until translucent,add in the whole spices, Cashewnuts and saute for a minute. Add the rice,salt to taste and water. Take exactly one whistle and off the flame,once the pressure releases open the lid and gently separate the grains with a spatula. 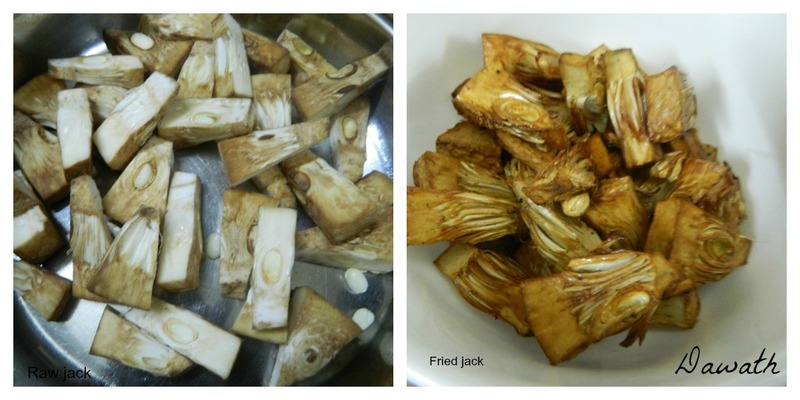 Grease a knife with oil and cut the jackfruit into one and half inch chunks,wash it thoroughly and drain the water completely,apply salt and keep it aside. Heat the oil and deep fry the Jack chunks until crisp and light,drain and set aside. In a separate pan heat ghee and fry onions for sometime. Add in the ginger garlic paste and all the powders one by one by lowering the flame and saute it. Add in the tomato sauce or pureed tomatoes and saute for few more minutes. Last but not the least add curds and cook unitl the gravy gets dry. Lastly add,fried jack and cashew paste and cook for few seconds and garnish with mint and coriander leaves. Preheat the oven to 200 deg C/400 deg F for 10 minutes. 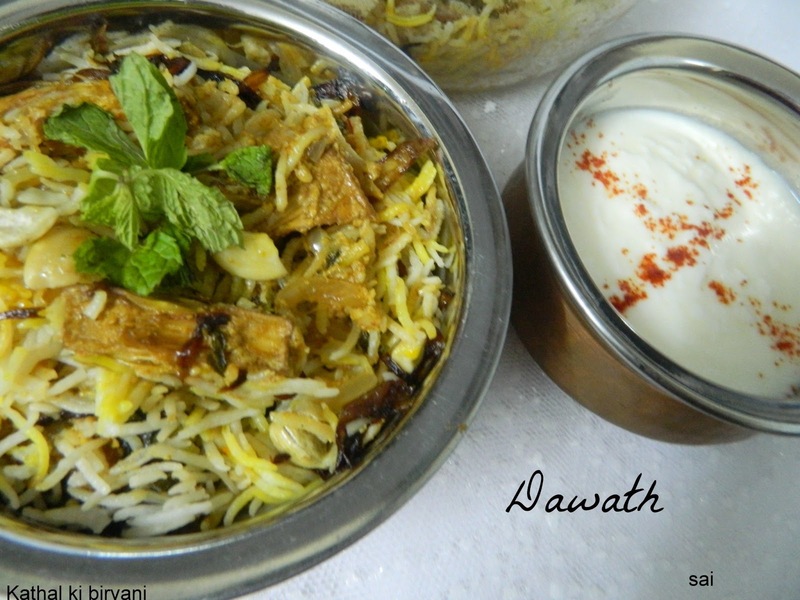 Take a large borosil dish or a oven proof dish arrange a layer of rice,sprinkle saffron milk,add the curry,garnish with brown onions ,coriander and mint leaves. Repeat the same procedure ,where the final layer should be of rice,garnish with remaining brown onions ,saffron milk,coriander and mint leaves. I just did one layer,rice,curry and rice,that’s it. 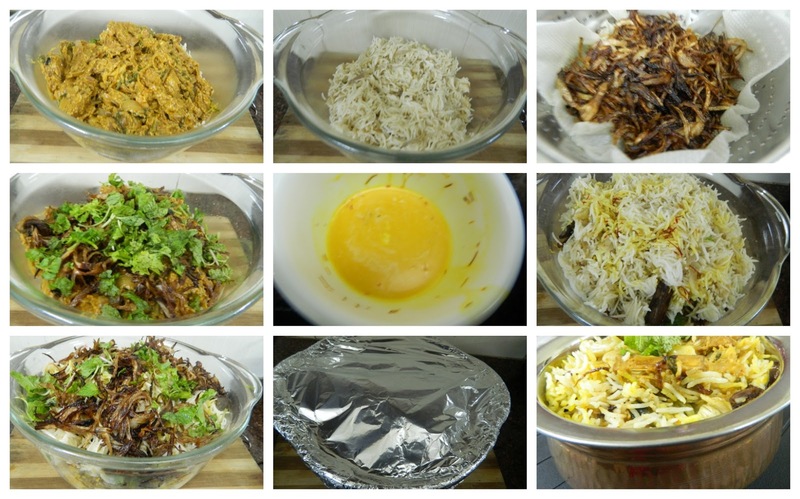 Cover the dish with an aluminium foil and cook in the oven for about 20 -25 minutes. 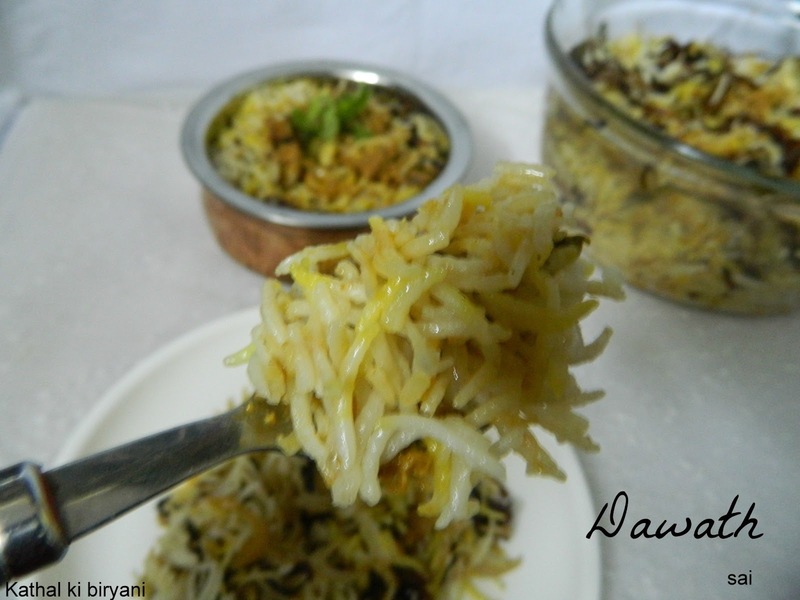 If you are giving dum in a microwave you may cover the biryani with cling film. 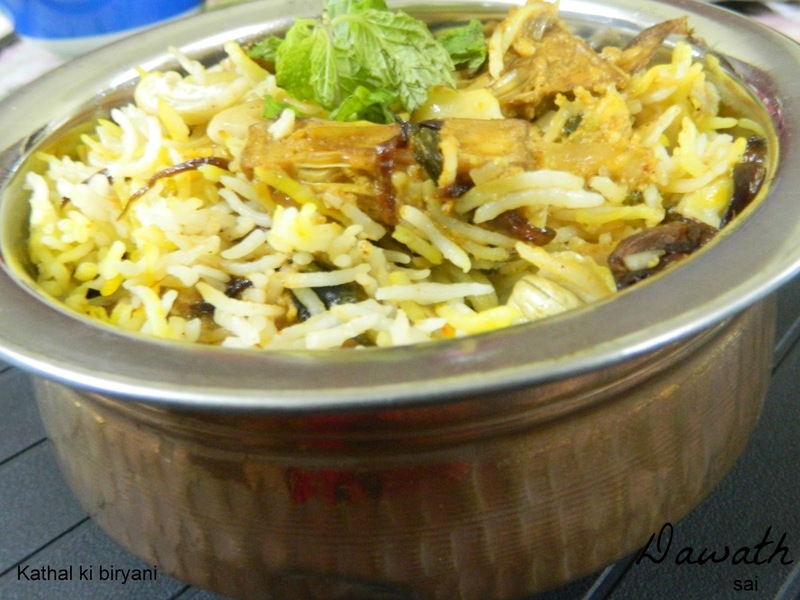 Wow briyani looks so delicious….I love raw jackfruit….mom makes gravy n poriyal…would try when I get hold of this sometime….